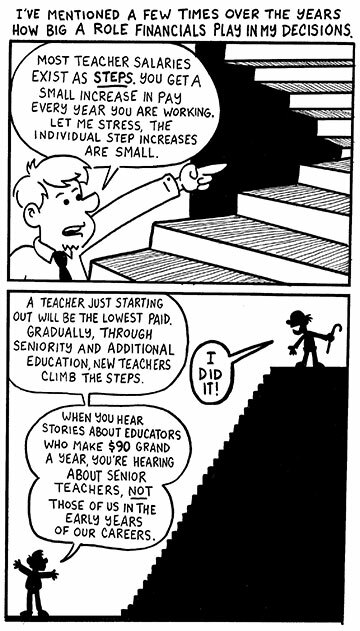 As I’ve mentioned in some of the comics lately, I’m leaving my current teaching position for a new gig across town. While I’m ridiculously excited about the prospect, it wouldn’t be honest for me to say I won’t miss my old job. I’ll miss some of the staff. I’ll miss the students, certainly. I’ll also miss working with Ms. Carmela Cotter, Middletown High School’s principal. I wanted to draw her a comic before a left… and this is what I came up with. I was asked to put all four of these comic into one post to share ’em, so here they are. 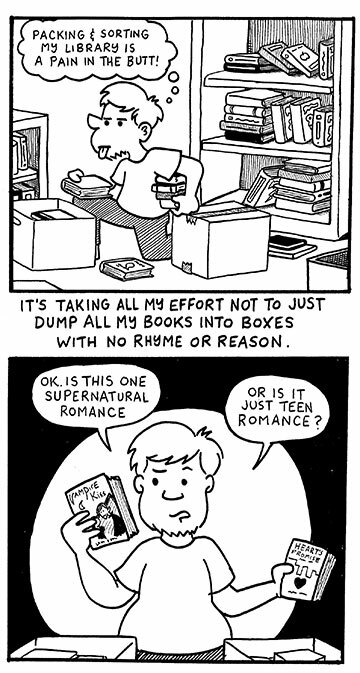 Teacher Comics: Putting the classroom lending library away. I know I said last week was the last week of comics, but I always have a couple of odds and ends before the final school bell rings. For those of you who’ve been reading awhile and know how important and vital my classroom’s lending library is to the way I do business with my students, you’ll understand what a Herculean undertaking this was. Ask me a question and I’ll answer you with a comic! Over the life span of this blog, I will occasionally ask readers if they have any questions for me. I’ll answer questions at any time in the comments but I will occasionally open those questions up to being fodder for my comics. I’m making that offer again right now – Ask me any question you like in the comments… ask me about teaching. Ask me about my personal life. Ask me whatever you like and the best ones will be turned into comic strips to be posted in the upcoming weeks! I’ve recently collected the best of the last few rounds of this in a small mini-comic you’ll be able to get your hands on in early June, if things go as planned! Ask your questions and maybe you can be included in the next volume! Every year on my class’s final exam, I give my students the same bonus question. 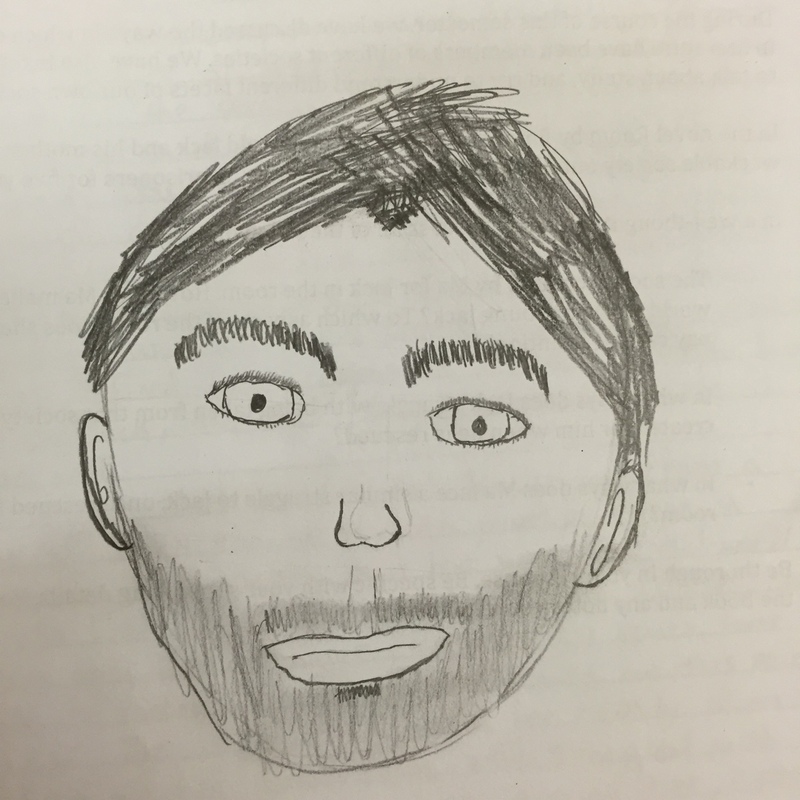 For a few extra points on the exam, they are asked to draw a picture of me on the back of their test booklet. I take my favorites out of all those drawings, frame them in my classroom, and hang them in the Mr. Pearce Art Gallery. These are some of the drawings from my Senior level English course; they get to take their final exams a week early in preparation for graduation. The King of Blues passed away yesterday at the age of 89. 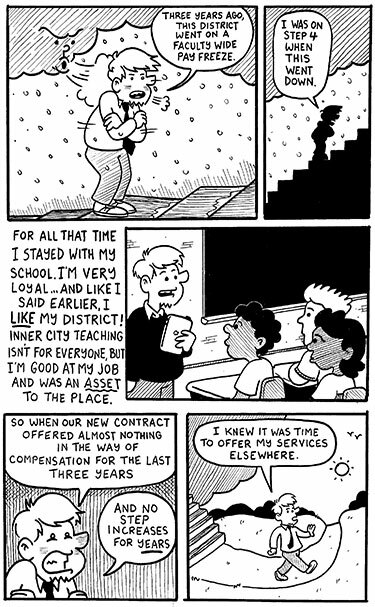 Here’s a comic I did back in 2010 where a bright student of mine not only bested one of my arguments but showed a depth of musical knowledge that was impressive for a 9th grader. 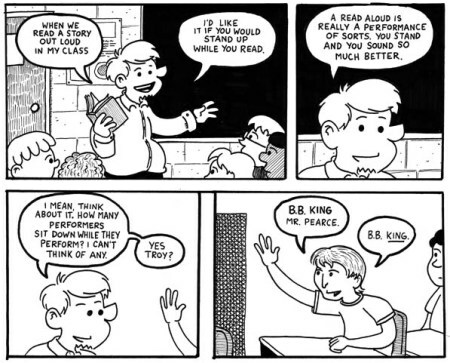 Rest well, Mr. King. 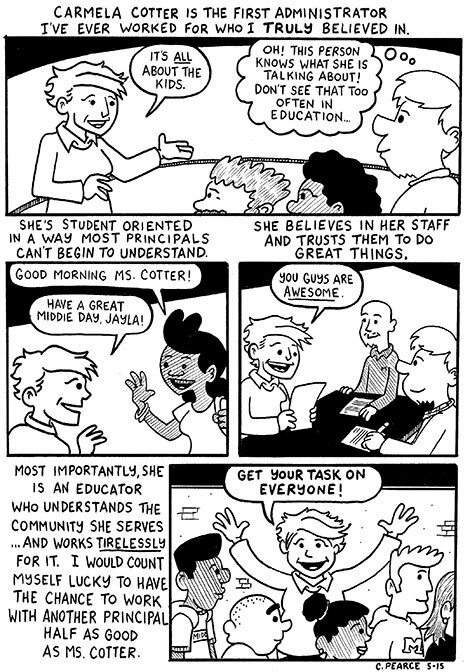 It’s especially a shame that urban schools deal with this constant drain of good teachers because those are the schools that need dedicated, inventive educators the most. In the end, I’m lucky to have found a comparable district to work where I’m servicing a similar clientele… but I’ll always feel a pang of sadness for having to leave a district where I was, for the most part, happy and productive. I don’t know that anyone from my current district is going to miss me all that much. I know some of the students will and that makes me happy. I have friends I will certainly be sad not to see regularly next year. At the same time, I’m excited about what the future holds… and I’m hopeful you’ll see comics about that transition. 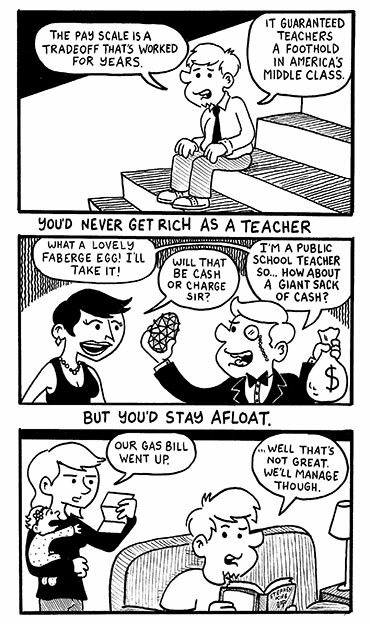 This is the last regular comic I’ll be posting and as such, it’s the end of the 2014-15 school year’s run of Teachable Moments. It’s been a heck of a good year for me on this experiment – I’ve received media attention at the local and national level. I’ve been invited to speak at colleges and comic conventions. I’ve been lucky to be published in great print magazines like Ohio Schools and some other ones upcoming I can’t talk about just yet. There will definitely be a couple of comics posted next week but as this is the unofficial end of the year, I wanted to take a moment to thank readers for coming along for the ride. Your attention, your likes and comments, the general reception I’ve received over the last few months has been overwhelming. I never expected Teachable Moments to have as broad an audience as it has developed recently and it’s rewarding to see people respond to my work as an educator so warmly. 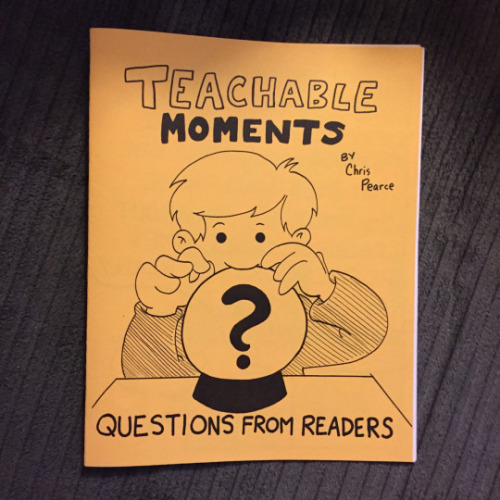 You are currently browsing the Teachable Moments blog archives for May, 2015.